For years, Reason was a walled-off garden. Propellerhead resisted supporting third-party plug-ins, and when they did, introduced their own native Rack Extensions technology for supporting them. That enables more integrated workflows, better user experience, greater stability, and easier installation and updates than a format like VST or AU allows. Propellerhead have been working on improving stability and performance continuously since then. Reason 10.3 is a much-anticipated update, because it addresses a significant performance issue with VST plug-ins – without disrupting one of the things that makes Reason’s native devices work well. The bad news is, 10.3 is delayed. The good news is, it works really well. It puts Reason on par with other DAWs as far as VST performance. That’s a big deal to Reason users, just because in many other ways Reason is unlike other DAWs. I met with Propellerhead engineers yesterday in Stockholm, including Mattias Häggström Gerdt (product manager for Reason). We got to discuss the issue, their whole development effort, and get hands-on with their alpha version. Okay, first, some technical discussion. “Real time” is actually not a thing in digital hardware and software. The illusion of a system working in real time is created by buffering – using very small windows of time to pass audio information, so small that the results seem instantaneous to the user. There’s a buffer size you set for your audio interface – this one you may already know about. But software also have internal buffers for processing, hidden to the user. In a modular environment, you really want this buffer to be as small as possible, so that patching and processing feels reponsive – just as it would if you were using analog hardware. Reason accordingly has an internal buffer of 64 frames to do just that. That means without any interruptions to your audio stream, you can patch and repatch and tweak and play to your heart’s content. Here’s the catch: some plug-ins developers for design reasons prefer larger buffers (higher latency), in order to reduce CPU consumption even though their plug-in technically work in Reason’s small buffer environment. This is common in plug-ins where ultra-low latency internal processing isn’t as important. But running inside Reason, that approach adds strain to your CPU. Some users won’t notice anything, because they don’t use these plug-ins or use fewer instances of them. But some will see their machine run out of CPU resources faster in Reason than in other DAWs. The result: the same plug-in setup you used in another DAW will make Reason sputter, which is of course not what you want. Another catch: if you have ever tried adjusting the audio buffer size on your interface to reduce CPU usage, in this case, that won’t help. So users encountering this issue are left frustrated. When it’s done, existing Reason users won’t notice anything. But users of the affected plug-ins will see big performance gains. I sat with the engineers looking at an alpha and we measured CPU usage. The results by plug-in are what you might expect. We worked with three plug-ins by way of example – charts are here. With Izotope Ozone 7, there’s a massive gain in the new build. That makes sense – a mastering plug-in isn’t so concerned about low latency performance. With Xfer Records Serum, there’s almost none. 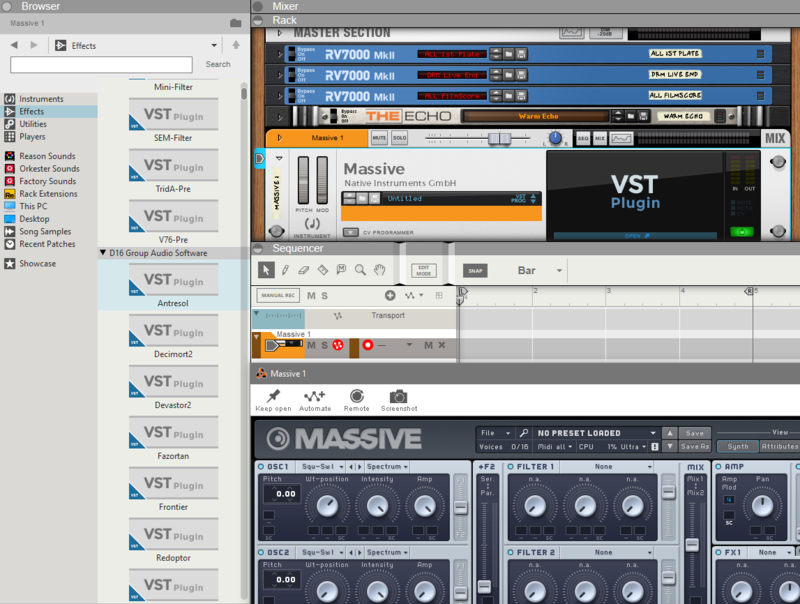 Native Instruments’ Massive is somewhere in between. These are just typical examples – many other plug-ins will also fall along this range. Native Instruments’ Massive gets a marginal but significant performance boost. Left: before. Right: after. Those graphs are on the Mac but OS in this case won’t really matter. The fix is coming to the public. The alpha is not something you want to run; it’s already in the hands of testers who don’t mind working with prerelease softare. A public beta won’t happen in the couple of weeks we have left in 2018, but it is coming soon – as soon as it’s done. And of course 10.3 will be a free upgrade for Reason 10 users. When it ships, Reason 10.3 will give you performance on par with other DAWs. That is, your performance will depend on your CPU and which plug-ins you’re using, but Reason will be more or less the same as other hosts beyond that. So this isn’t really exciting stuff, but it will make your life easier. We’ll let you know how it comes and try to test that final version.